David F. Walker and Sanford Greene are the team behind the recent hit series, Power Man and Iron Fist, which I loved. So when I heard they have reunited for a creator-owned series over at Image Comics with Chuck Brown, I knew I had to give it a shot. With Bitter Root, I got a book I wasn’t expecting. Let me rephrase that: Bitter Root blows away any expectations. Set in the 1920’s in Harlem, we meet the Sangerye family, a family who have protected humanity from the demonic Jinoo for generations. Some, of course, being more skilled than others. We meet the brash Cullen, who seems to be learning the ropes of battling the force of evil, the massive Berg, who is eloquent and deadly, Blink- who would rather be fighting on the front lines than mixing serums from roots with the family patriarch, Ma. We get to see Cullen and Berg in action and Blink steal the show with his skills with a bo staff. We also see a mysterious figure at the end of the book that makes a massive impact on one splash page. I love the premise here. It’s one we see a lot in the popular arts: family fights evil throughout their lineage. But its all about execution, and this creative team delivers big time. The story feels fresh and organic, the artwork is fantastic and feels like a throwback to the 20’s. I would love not only to see where the Sangerye family goes from here but see what past ancestors did in their protection efforts for the world. 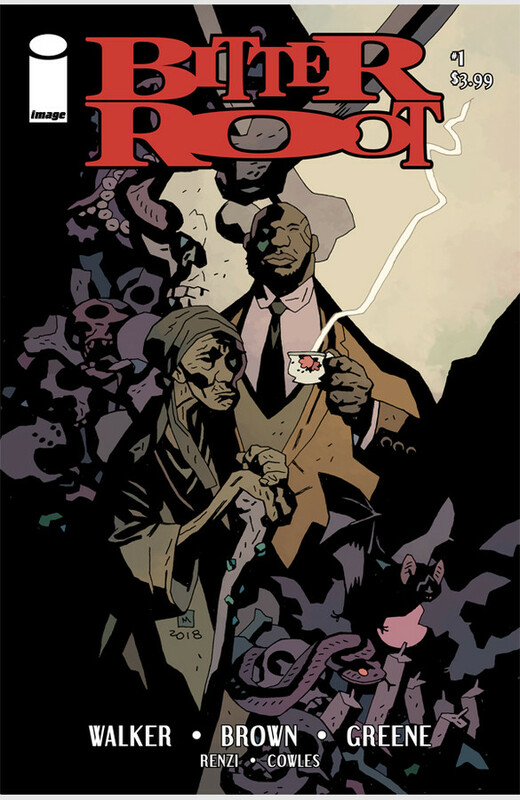 If you are looking for a fresh new series to try, I cannot recommend Bitter Root enough. Fans of Supernatural and Grimm, this is the book you should be reading. I am officially on board for the long haul, Bitter Root’s debut is that good.